A compact miter saw makes many jobs easier. It can be taken to the job site or used at home, for multiple projects. Features are sometimes important to the user, depending on the job and the types of projects the user wants to tackle. Makita makes a handy model for a variety of jobs, at an affordable price. Read on for a Makita LS1018 Miter saw review. Easy to assemble. The saw is easy to assemble and adjust. The angle and fence will require some adjustment, prior to first use. lean, smooth cuts. This is important for those who want professional looking results from a saw. Good value. Many buyers say this model is a good value for the price. Square cuts. This is important for those looking to achieve professional results with every cut. Fence is awkward. That means the saw is going to be easier to use for those who are left handed. It would have been better to have a multi-user fence. The fence can’t be adjusted for multiple miters. Lacking power. Some users say thicker pieces of wood hang up on the blade. A different blade may help. For consistently larger pieces of lumber, a different model may be desirable. Turn knob adjustment. Not a handy feature. Users say it would be better if the saw had a quick lever or pull, rather than turning the knob in and out. The saw is priced around $275. 2. Does the saw come with a warranty? 3. What is the blade size? The blade is 10 inches. This saw will make cuts up to 12 inches. 4. What is the weight of the saw? The saw weighs 43.7 pound out of the box. 5. What kind of jobs is this mini miter saw designed for? The saw is designed for finish and carpentry work, such as crown molding, trim, woodworking, and general carpentry. 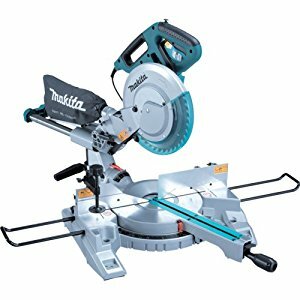 What Makes this the best compact miter saw? The best compact miter saw is one that can be taken to any job and performs as expected, with professional results. While the fence and angle may require some adjustment, The saw works as expected and the blade provides a smooth, clean cut. A saw for use on a job site or around the house should be light weight, accurate, and have enough power for many different jobs. The Makita LS1018 is light enough to transport, yet powerful enough for most cabinetry, trim, and carpentry jobs. Some users recommend buying different blades, for different types of jobs. Harder woods and plywood often require a blade with more teeth, for a smoother cut. Most users say they get square, accurate, and smooth cuts when using this saw. If a potential buyer likes the rest of the feature, this is one of the best compact miter saw models to consider.